Immerse yourself into this vibrant and fascinating continent. Discover unique and enchanting destinations. Let the world’s largest country floor you with its sheer size, magnetic natural beauty and grand opulence, charm and delight you. Sit back and surrender to the warm hospitality and humble lifestyle of the Russian countryside, as you glide along grand canals, explore imperial cities and romantic wooden villages, and celebrate this formidable nation. From St. Petersburg, cruise the Neva River and arrive in Mandrogi, a tiny island that is more a living museum than a live-in village. 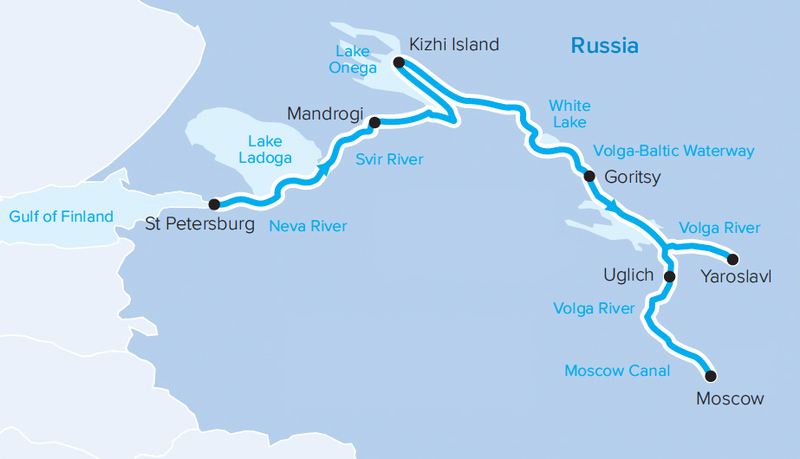 Further along the peaceful stretches of the Svir River absorb the picturesque Russian countryside and cruise towards the tranquil waters of Lake Onega, Europe’s second-largest lake. Watch in awe as you approach the spellbinding sight of Kizhi Island. Visit the Open Air Museum of Architecture, a renowned World Heritage-listed site. Marvel at the collection of well-preserved wooden houses, windmills and churches that date back to the 14th century. The island is dominated by the magnificent three-tiered Transfiguration Church, a 22-domed structure built in 1714 without a single nail. Cruise the ethereal White Lake and along the Volga-Baltic Waterway that connects the Baltic and Caspian seas. Arrive in Goritsy, a peaceful farming town. 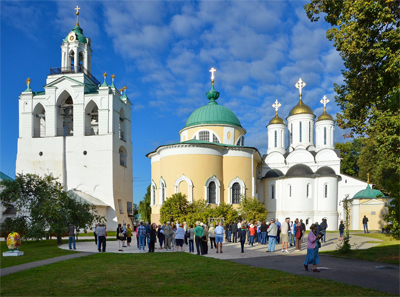 Visit one of the largest medieval abbeys in Russia, the Monastery of St Cyril. 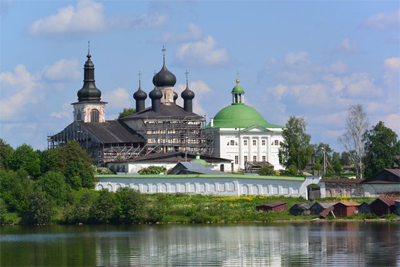 With eleven churches built within its walls, this impressive monastery was once home to a huge settlement of monks, who were shot or sent to concentration camps after a Bolshevik invasion. 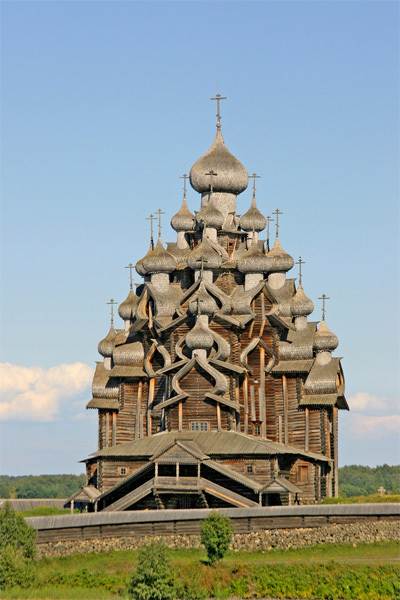 Today the monastery remains an important part of Russia’s spiritual history, and features an intriguing collection of ancient artefacts. Discover what is considered the pearl of the glorious Golden Ring cities, Yaroslavl, founded by Prince Yaroslav the Wise, this is one of Russia’s oldest cities and dates back to the age of the Vikings. Explore the World Heritage-listed historic centre, adorned with classical architecture and golden domed churches, and visit a 12th century monastery. Watch idyllic rural life unfold along the river banks as your ship cruises to the provincial town of Uglich, one of the historic Golden Ring cities that form a ring to the northeast of Moscow. Step back in time and embrace olden day Russia. 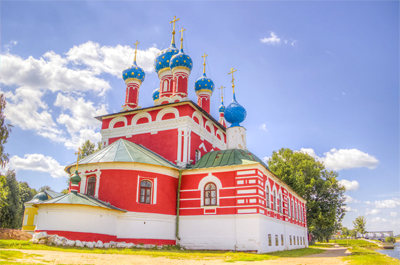 See the former Kremlin of Uglich and visit the colourful Church of St Demetrios on the Blood. Built on the site where Ivan the Terrible’s son Demetrios was mysteriously killed in 1591, this monument commemorates the famous Rurikovich family. Sail along the Volga River towards Moscow. Trying to find the right cruise can feel like an almost impossible task. Let us help you- Contact us today. We can also help with cruising the Baltics and Helsinki.